Senator Deb Fischer and FCC Commissioner Brendan Carr made a stop recently at Stanton Telecom of Stanton, Nebraska. Consortia’s Dan Caldwell was on hand to discuss the impacts of recent USF reforms on this Consortia client. 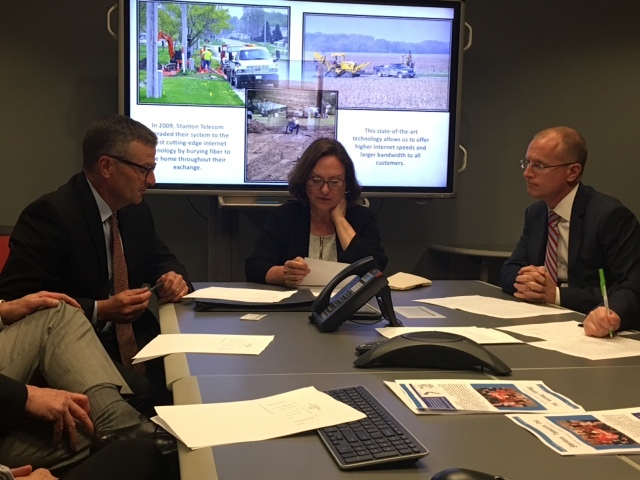 “Stanton Telecom, and Consortia, greatly appreciated the opportunity to visit with both Senator Fischer and FCC Commissioner Brendan Carr on the importance of sufficient Universal Service funding for rural broadband providers,” said Caldwell. This meeting was followed by an industry round table discussion that included other Nebraska rural telephone companies and industry representatives.